The deadline will be the 31st of December. We will notifiy you if your story is accepted as soon as we finish the reviewing process. We are a new imprint, and this is the first time we have opened our doors to outside submissions - so it's only fair to tell you how we work. Previously, we have published two anthologies. Rather than paying a set fee to contributors, we have divided royalties received from sales equally between all contributors. The book remains in print for a year and then is removed from sale. For Tales From The Universe, we are adjusting that formula slightly by giving Inklings Press itself one share, equal to each contributor. So if there are eight stories in the anthology, each contributor will receive 1/9 of the royalties, including the press imprint. Contributors will receive monthly sales reports and payouts in a similar time frame to those sent out by Amazon. 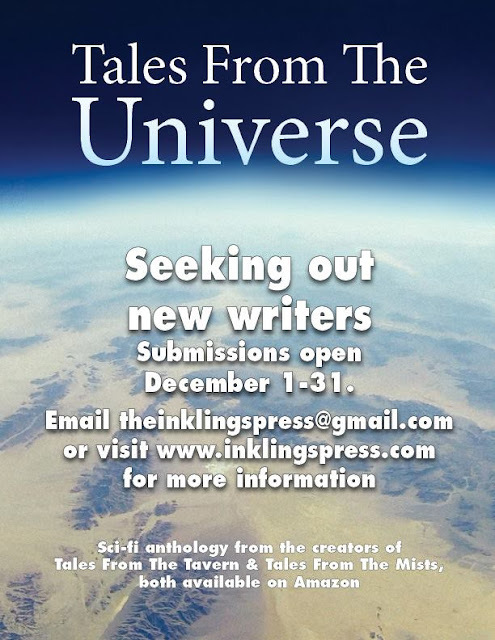 Inklings Press will promote sales of the anthology through its social media accounts and website, and also in partnership with the Altered Instinct blog, where writers will be encouraged to take part in Q&A sessions and other promotional work to help show the world why they should buy the anthology! We want you to be part of the process of letting the world know about the anthology too - before publishers, we are fans and writers first and foremost. So we only ask one thing from you (besides your story) if you want to pitch in: if your story is included, we want you to help promote the book, be it on Facebook, twitter or your blog, because that means that we can reach more people, your story will be read by more and at the end will help you as well as us to raise our profiles as writers and as a venue to publish your stories. So what does being a part of the anthology mean to you? First, you get a part of sales income shared with your fellow writers. We don't pro-rate this according to number of words written, it's an even split between contributors. Second, your work is still your work. You grant us licence to use it in the anthology during its period of sale for a year. At the end of the year, it is removed from sale. If all authors wish to continue selling the anthology, we discuss that at the end of the year, but it only stays on sale by agreement of all authors. It has to be unanimous. That bit where we said the work remains your work? That also means that by all means you should feel free to make it available to other outlets. Some of those will say no because it has been published elsewhere, of course, but we don't mind you offering it if they're interested. Third, we aim to encourage new writers. We're a new platform ourselves, so don't expect millions of sales yet! But we'll happily share all the information we garner ourselves as we establish a foothold in the publishing world, and how we go about doing so. We're like you, new to the game, and looking to give a helping hand. So hop aboard. Tell us your tales. Make them big. Make them smaller than small. Make them scintillating. Join in the Tales Of The Universe.